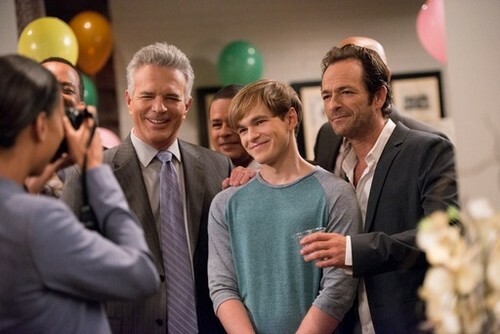 Tonight on TLC Major Crimes airs with a brand new episode. On tonight’s episode called “Cutting Loose”, the star of a cop show becomes the prime suspect in the murder of a fan. The fact that Major Crimes member Mike Tao serves as a consultant on the show further complicates the case. Luke Perry guest stars. On the last episode when SWAT officers working on Crime Suppression discovered an elderly couple gunned down in their own home, Major Crimes teamed up with the LAPD’s Special Operations Bureau to hunt down a killer stalking the city of Los Angeles, and taking hostages along the way. Jon Tenney, Laurie Holden, Lindsay Price, Malcom-Jamal Warner, Bill Brochtrup, Brock Harris and Hampton Fluker guest starred. Did you watch the last episode? If you missed it we have a full and detailed recap, right here for you. On tonight’s episode when SWAT officers working Crime Suppression discover an elderly couple gunned down in their own home, Major Crimes must team up with the LAPD’s Special Operations Bureau to hunt down a killer stalking the city of Los Angeles, and taking hostages along the way. Jon Tenney, Laurie Holden, Lindsay Price, Malcom-Jamal Warner, Bill Brochtrup, Brock Harris and Hampton Fluker guest star. Tonight’s episode is going to be filled with action and you won’t want to miss it, so be sure to tune in for our live coverage of the show tonight at 9 PM EST! While you wait for our recap hit the comments and let us know how excited you are about the third season. The skeletal remains of an unknown woman were found in one of the containers at a storage facility. The exact container belonged to John Worth, the TV actor, who’s been working with Lt. Mike Tao. It seems with three kids in college Mike had to pick up a second job but no one ever expected he would give a possible killer the idea to kill someone much less how to hide it. While he was consulting on the show – he mentioned that a storage container was the best place to hide a body so their primary suspect is the Johnny aka Johnny. But they needed to question him without him lawering up so Mike had to pretend that the police needed Johnny to come in and help them with a case. So Mike received rock star treatment all the while the police were searching into him. And what they found out is that Johnny doesn’t deal with his container personally. Once he has his clothes stored in there then it falls under his assistant’s duties and Kiki, the assistant, didn’t have any reason whatsoever to kill Zelda Lambert or so it looked like at first glance. Zelda was Mike’s stalker. She followed him everywhere and Mike had to take out a restraining order against her but Zelda had told her husband, who had no problem with her obsession, that Johnny’s new assistant was the true violent one. She said Kiki was obsessed and had assaulted her on. Though no one was willing to take the stalker’s word over the assistant’s. Kiki allegedly punched Zelda because Zelda had once got her fired. However Kiki was re-hired after Johnny found out about the mistake. So the detectives asked “where was Kiki?” and the answer was Mexico. Johnny had an appointment he couldn’t make (because of the secret investigation) so he sent his assistant in his place. All the evidence indicated it was either one of them or both of them working in collusion. Yet someone sent out a letter to indicate where Zelda’s body was. Now why would a typical killer want to do that? Kiki was unreachable in Mexico. She doesn’t bring her cell phone when she goes down there. Johnny said it was a way to escape international roaming charges. And he can only get into contact with her after she reaches out to him with a burner cell. So it was nearly impossible to conduct a proper investigation with merely Johnny. He was cliché actor – full of himself and not all that bright. And then a moment of stupidity as it turns out saved him from jail. He tweeted about the case including pictures and evidence. He basically told the whole world he was helping with the investigation of his stalker’s death. Once he did that – the cops could no longer ignore what was technically his civil rights. So they were forced to let him go. Although he didn’t take the hint. Johnny stayed and when he was trying to convince the captain to let him take the evidence board home as a souvenir he noticed something. He saw the car Zelda had been driving and told the cops how expensive it was. A car like that would have erased Zelda’s debts. Because she heavily sent her and her husband into debt with her need to stalk Johnny despite parking in red zones and buying up essentially everything with his face on it, voice, and/or signature on it. Hence Provenza was right again – it is always the husband. Zelda’s husband couldn’t sell the car with his wife’s name still on the deed but if she was dead then as next of kin he could sell it without any problems and get out of debt. That’s why he told the cops were to look for the body. And when he tried to get out of confessing – the police actually sent in Johnny to make him sweat. The plan worked, even though it wasn’t that great of a performance, and because of the sudden interests in his and his assistant’s life – Johnny’s TV show got picked up for a new season which means Mike still has a job. Johnny wasn’t that bad of a guy. When he was finished with the case, he decided to go celebrate Rusty’s graduation with the rest of the guys. He’s not smart but he is nice!